Ancient History Archives - Joelle Delbourgo Associates, Inc.
A Fulbright Scholar to both India and Malaya, John Gaudet is a writer and practicing ecologist. His early research on the ancient aquatic plant, papyrus, funded in part by the National Geographic Society, took him to Uganda, Kenya, Sudan, Ethiopia, and many other places in Africa where papyrus grows. His work has been discussed in Nature, and by Peter Moore on the BBC show Science Now, and in an article by Alan Cowell in the New York Times. Known as Bwana Papyrus, he came by his name honestly in Africa while working in the swamps along the Nile River. He is a trained ecologist with a Ph.D. from University of California at Berkeley and is the author of many scientific papers on the ecology and development of papyrus swamps. His writing has appeared in the Washington Post, local magazines, and online. 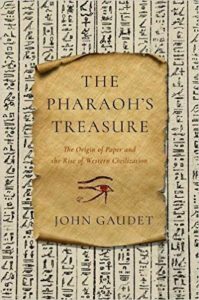 His new book Pharaoh’s Treasure: The Origin of Paper and the Rise of Western looks at the pivotal transition to papyrus paper, which would become the most commonly used information medium in the world for more than 4,000 years. Far from fragile, papyrus paper is an especially durable writing surface; papyrus books and documents in ancient and medieval times had a usable life of hundreds of years, and this durability has allowed items like the famous Nag Hammadi codices from the third and fourth century to survive. Follow John Gaudet on Twitter where he goes by the handle @BwanaPapyrus.